Emily Weber began her training with the Victoria Ballet Theatre in Victoria, Texas as well as the Ballet Austin Senior Summer Intensive, and the Central Pennsylvania Youth Ballet Summer Intensive. During her time with Victoria Ballet Theatre she performed many ballets including: The Nutcracker, Peter and the Wolf, La Bayadere, The Red Shoes, Swan Lake, Don Quixote Suite, and Graduation Ball, as well as other various works of choreography. Along with these performances she also had the opportunity to travel to Austria with Victoria Ballet Theatre to perform in the Tanzsommer Dance Festival. Emily attended the University of Iowa where she received a BA in Dance. 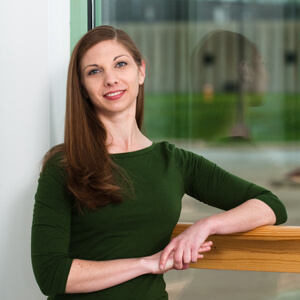 During her time at the University of Iowa, Emily worked on several independent projects with undergraduate and graduate students, performing in several UI dance concerts as well as creating her own choreographic works. She also worked with faculty members and their choreography projects, and was an active member of the UI Afro-Cuban Drum and Dance Ensemble. In 2009 she received her certification as a yoga trainer. After graduating from the University of Iowa in 2010 Emily has taught ballet at Devine Dancers and participated in Iowa Dance Theatre’s Cinderella, Nutcracker and Seven Deadly Sins. Emily is a proud member of Dance Masters of Mid-America, chapter 34.